The 11 Inch Army Soldier is a dollar store action figure that comes with a really, really happy guy who looks like a black Ken doll. He is wearing a cloth hat, a cloth uniform, a left boot and a right boot. The reason I specify a left and right boot is because upon closer inspection, I found out they are actually 2 different boots. At first, I thought the uniform just came out of the boot but they really are 2 different boots. One is shorter than the other and that is why it was not tucked in. Surprisingly, the 11 inch army soldier figure actually measures 11.5 inches. When I first picked it up it did not even seem 11 inches tall, but to my surprise the army figure was, in fact, 11.5 inches tall. What I can’t seem to figure out is why they did not go the extra half an inch to make it 12 inches. He could have been made the 12 inch army soldier and been given a really cool title like the Foot Soldier. But alas, they ruined that chance of making a cool dollar store army soldier toy and made a really lame army soldier. He is still pretty happy though. He’s still taller than the usual Caucasian version, which is several inches smaller, even when standing tall and at attention. But that size advantage is all this army guy has, since he has no equipment whatsoever. No pistol, no knife, no tactical nuclear strike, not even a backpack. I mean really, even Solid Snake from Konami’s Metal Gear and Metal Gear Solid games is given a couple items even though he is sent in and is expected to get what he needs as he goes. I am not even sure if he is supposed to be an army guy. The details mention him to be a rescue action figure. I did not even get this guy at a dollar store. I found him in the dollar section of a grocery store. Unfortunately, there is not much you can actually do with the army soldier, rescue guy or whatever he is supposed to be unless you want to buy a bunch of them. That might be much harder to do than it seems since many of the stores I have visited do not have anything close, except maybe a large Spiderman figure I neglected to pick up. In the meantime, he can be a friend to the captain Jean-Luc Picard action figure someone got me a while back that is still in the box. Picard could be a collector’s item and he actually comes with equipment. He gets a Starfleet Compression Rifle, Borg Scanner, Laser Light and a Starfleet Action Base that he can be mounted on. But enough about Picard, he is not a dollar store item. The army guy probably would have been a collector’s item had the package stayed together. The plastic casing fell off the cardboard backing so it’s no longer in the original packaging. It’s no longer a collectible. What do you think? 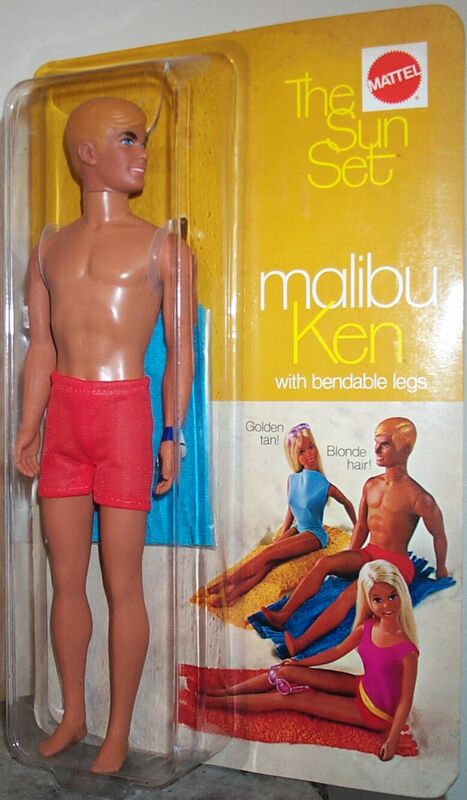 Real army guy or Ken playing dress up?